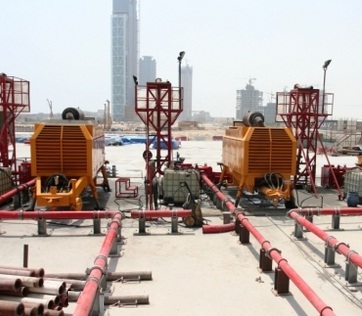 How can Pipeline be laid for Efficient Concrete Pumping? In the previous post we have learned about pumpable concrete and required diameter of pipeline to have efficient pumping maintaining concrete unsegregated. Proper mix design and suitable diameter and thickness of pipeline also resist concrete blockage. With these requirements, proper laying of pipeline is also a important factor to produce a maximum efficiency from pumping. Many difficulties and time can be saved in the construction site, if positioning of pump and proper laying of pipe are planned with care. In the pipeline system, if there have leak in pipe and coupling, plugs are formed frequently causing subsequent obstruction to concrete flow through pipeline as water and/or air are escaped through leaks. A pipeline is combination of 1,2 or 3 m long individual pipe which are connected at locking coupling of various types. When direction of flow is required to change, bends of various degrees are introduced. The typical bends are 900, 600, 450,300 and 150. The bends are of typically 1 m radius. But sometimes in case of placing booms, bends of 250 mm radius are used. At bends, pipelines should be anchored well. There have some difficulties in dismantling of vertical pipes for blockage or for many other situations. To avoid this, special care is taken in laying vertical pipelines and only pipes of good conditions are chosen. There should have a starting distance between pump and vertical pipelines. The distance may be 10%-15% of vertical distance. Hi nice, How can Pipeline be laid for Efficient Concrete Pumping? Hi, good post this is very precise. Thanks for sharing. Interesting post about concrete pumping. your blog is excellent....I really liked your blog, appreciate the great information. Really great post. I like it.